Linked blinds is when you have two or more blinds side by side in the same window or door frame sharing a single middle, or intermediate bracket. Linked blinds are particularly useful when you have a large window, ranch sliders or bi-fold doors that are too wide or oversize for one blind – by splitting it into two or more it allows you to have one chain control for each blind or one chain control for two blinds. Here in New Zealand where we often have large door sets for indoor outdoor flow – linking your blinds together will reduce the gaps between the blinds and allow you to keep the chains to the sides of the frames. How to measure for Linked roller blinds. Decide where you want to split the blinds in the window – we always recommend the split be where the aluminium or wood frames( called mullions) run down the window. If you split the blinds where the joinery runs down the window or door there will be no gaps between the blinds visible from the outside. Next with a pencil, put a mark at the top of the frame where the joiner bracket will be attached - again this is usually in the centre of the mullion that runs down the window. Start by measuring from the left hand top corner to the pencil mark – this will be your first split blind – always double check your measurements. Next, measure from the pencil mark over to the top right corner – this measurement will be your second split blind. – again always double check your measurements. To check your measurements add the two split measurements together and they should equal the overall measurement from top left hand to top right hand corner. Remember to enter the exact measurements into the website as we will make all the necessary deductions so the two blinds and all brackets fit neatly within your frame. Complete the two extra questions - this will complete the first split blind. Enter your measurement for the second split blind on the website, again completing all the standard questions. When you fill in the optional extra section you will again complete the two extra questions - this will complete your second split blind. When we manufacture the two roller blinds we will take all the necessary deductions off your measurements, so both the two blinds, end brackets and single middle bracket will fit within the frame including a small fitting tolerance. What size is the gap between the blinds? Depending upon how you measure between twenty to twenty four millimetres. How much does a linking bracket cost? Good News here – for most applications the linking bracket is just $20.00 per set. Is it easy to attach a linking bracket? It is very easy to attach a linking bracket. There are holes in the foot of the bracket that allow you to attach it up into the roof of the frame. Will the linked blind be the same colour as the end brackets? Yes. We will match the linked bracket to your bracket colour selection. Will each blind have a chain control? Yes, each blind will have its own chain control so it can be pulled up or down independently of the other blind. We usually recommend to put the chains on the sides closest to the frame. 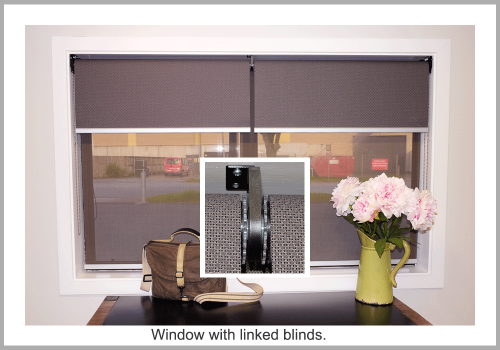 Do you do a linked blind option – where you have one chain control to operate two blinds? Again yes we do. There are quite a few options available – please contact us so we can understand your exact requirments.